A real all-round horsewoman who cannot be slotted into one box: Tanya must be one of the more diverse characters in the equestrian world. 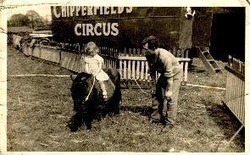 Her life started in the circus where her parents Marion and Peter met and married. As animal trainers and presenters, the family's empathy with all animals has given them an understanding of how to train with co-operation. Tanya said that "many things that are promoted as new or natural has been done in circus many years ago, such as riding with no tack". For her, real liberty is when 20 stallions work together in a ring with no harness on! With Salute, a medium level horse that came to her with 'baggage', she set her sights high and went on to the team for the Worlds, the Europeans and two Olympics. 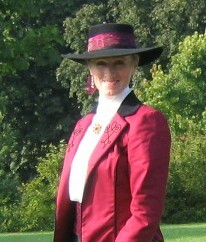 This is one part of the story: there is much more than dressage in this lady’s 'tool box', from starting horses for racing, to showjumping, eventing, stunt and TV work, becoming a best-selling author, a designer of children's toys that were short listed as Best Childrens Products and a producer of equestrian displays - even racing camels at Olympia with her dad. As a trainer/coach Tanya is on the British Dressage (BD) and the British Horse Society Register and she is also following the UKCC (coaching) system and is now a BD level 3 Coach Educator. Tanya said, "The UKCC coaching is the way all the disciplines are going. For me, doing the course backs up what l do anyway, but it also provides an insight into other areas of coaching." 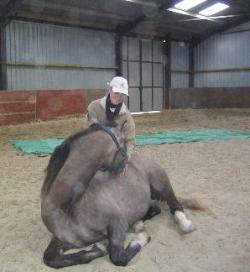 She had just been appointed by BD as the Para Coach for the South East and London British Equestrian Federation Foundation Squad. Throughout her whole career animal welfare has always been at the front of what Tanya promotes as a trainer. She does not focus solely on the competition world; her doors are open to all - any age person and any breed of horse or pony, as long as they want to learn. She feels that, for the horse to have a good life, it is up to us to know how to make it better for him. Right from the beginning you need respect both ways with clear boundaries. Tanya's horses are started through lungeing, long-reining and general tolerance training including getting used to plastic bags, bridges and doing lateral work from the ground. Her three year-old 16.2 hand horse Sonny (by Idolo) already lies down when asked with no lunges used in his training, he works at liberty. So far he goes sideways, backs-up and picks things up when asked, he has now started long-reining as an important part of his education before he is ridden, his career will be as varied as his owner's. His ridden training will go as far up the scales as he comfortably can, he will drive, do a liberty routine and take part in her displays. Tanya says there is no magical answer to training: it is all about logic, time, understanding and patience. Starting at the beginning the horse has to learn to learn before he can progress. Once that process is started then you have the blank pages to build on and create the foundations for training. 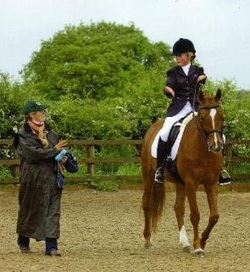 When a horse is asked to do something be it ridden, driven, jumped, ground work or liberty, the trainer must make sure they are allowing it to happen and not blocking it, to get the right answer the question must be asked correctly, as they influence the horse by the contact, balance and their position.